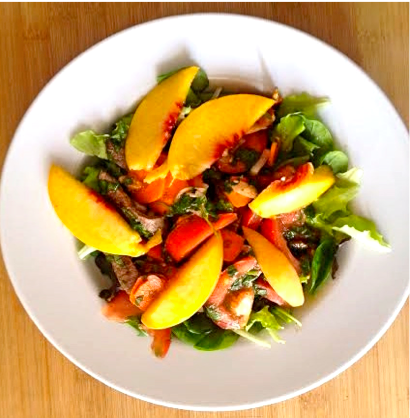 Summer & Salads … two of my favorite things! As summer is approaching and the weather is warming up, it’s the perfect time of year to incorporate more creative salads into the mix for a refreshing lunch or dinner. Actually, I enjoy a delicious salad at any time of the year, but they’re especially ideal now that I’m 6 months pregnant this week (yay!) and trying to keep a well-balanced, high-protein, high-fiber and low-carb diet (well, for the most part, aside from my cravings for salty-savory chips/fries or lemon popcicles ). The good news is that they’re healthy and really easy to throw together if you’re short on time. I use a few basic ingredients to create a light, Thai flavor-inspired dressing and then I mix up the fruit and/or vegetables and add in grilled beef or chicken. (Vegetarians can use the same general ideas/ingredients and just skip the meat, maybe add some beans to increase the protein portion). The basic dressing: When I make a salad with grilled beef my favorite dressing consists of 3 or so limes (squeezed), a drizzle of olive oil, a dash of fish sauce, and chopped up mint and cilantro. Add a bit of salt, black pepper and red pepper to spice things up. For grilled chicken, I prefer to use lemon instead of lime, but the rest of the ingredients remain the same. 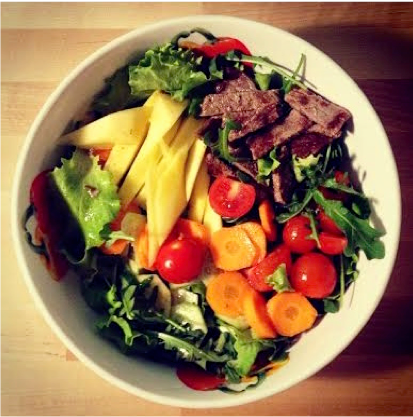 A bed of mixed greens with cherry tomatoes, sliced carrots, grilled beef, sliced cucumber and mango topped with the cilantro, lime, mint dressing. 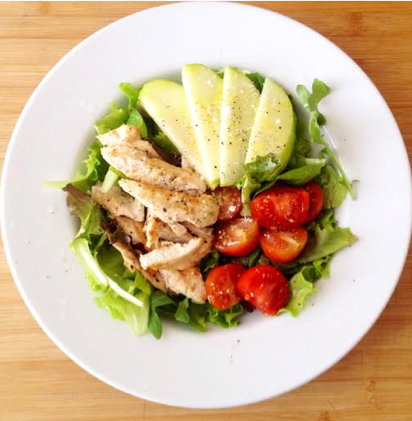 A bed of mixed greens with cherry tomatoes, crisp green apple slices, grilled chicken and the lemon, mint, cilantro dressing. 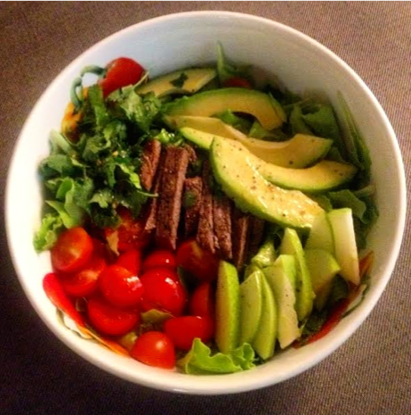 A bed of mixed greens with cherry tomatoes, avocado and green apple slices and grilled beef topped with the cilantro, mint, lime dressing. A bed of mixed greens with carrots, cherry tomatoes, sliced up shallots, grilled beef, nectarine slices and the lime, mint, cilantro dressing. Naturally, these are just some general ideas, but you can pretty much change up the mix and add whatever fruit/vegetables you prefer. Bell peppers, grilled zucchini or eggplant, sprouts (unless you’re pregnant) … and grilled salmon would be a great alternative to beef or chicken.